For additional information on the current bus services, see List of bus routes in Queens and Select Bus Service. The Q20A and Q20B (collectively referred to as Q20A/B or Q20) and Q44 bus routes constitute the Main Street Line, a public transit line in Queens, New York City, United States, running primarily along Main Street between two major bus-subway hubs in the neighborhoods of Jamaica and Flushing. The Q20A/B terminates in College Point at the north end of Queens. The Q44 continues north into the borough of the Bronx, terminating in the West Farms neighborhood near the Bronx Zoo. The Q44 is one of two Queens bus routes to operate between the two boroughs (along with the Q50). The Q44 and Q20 were originally operated by the North Shore Bus Company from the 1930s to 1947; they are now operated by MTA Regional Bus Operations under the New York City Transit brand. In June 1999, the Q44 began limited stop service in Queens, with the Q20 split into two branches to provide local service. On November 29, 2015, the Q44 was converted into a Select Bus Service (SBS) route. The current Q44 route begins at the intersection of Merrick Boulevard and Archer Avenue in Downtown Jamaica, Queens (or Jamaica Center), just south of the 165th Street Bus Terminal. This terminus is shared with the Q17. Traveling west along Archer Avenue, it passes the Jamaica Center station of the Archer Avenue subway and its bus terminal. At the Sutphin Boulevard subway station, which connects to the Jamaica station of the Long Island Rail Road and AirTrain JFK, the route turns north onto Sutphin Boulevard. It then turns west onto Hillside Avenue and north onto Queens Boulevard, interchanging with two stations of the IND Queens Boulevard Line. At Main Street the Q44 turns north, running the entire distance of the street between Queens Boulevard and Northern Boulevard in Downtown Flushing (also known as Flushing Chinatown). In Downtown Flushing is the Flushing–Main Street terminal, where several bus lines, the IRT Flushing Line subway, and the LIRR Port Washington Branch interchange. The Q44 shifts onto Union Street and Parsons Boulevard to 14th Avenue in Whitestone. It then enters the Bronx–Whitestone Bridge, sharing the bridge with the Q50. Throughout Queens, the Q44 provides limited-stop service, making intermittent stops primarily at major intersections and points of interest. After entering the Bronx, the Q44 and Q50 follow the Hutchinson River Parkway service road to just south of the Bruckner Interchange, making only two stops: one at Lafayette Avenue, and another one at Brush Avenue and Bruckner Blvd, where passengers can also connect to the Bx5 bus. While the Q50 turns east to follow the Bx5, the Q44 turns west onto East 177th Street (the Cross Bronx Expressway service road), running along either direction of the road. At the Parkchester subway station, the Q44 goes around the Hugh J. Grant Circle. The Q44 continues along East 177th Street until the interchange with the Sheridan Expressway, where it turns north onto Devoe Avenue. The Q44 stops at East Tremont Avenue near the West Farms Square subway station, and terminates at East 180th Street at the southern boundary of the Bronx Zoo. Buses lay over on a bridge over the Bronx River, before reentering service on Boston Road. Although the Q44's northern terminal is signed as "Bronx Zoo" (formerly "Bronx Zoo − West Farms Square"), the zoo is not accessible from this location; the closest entrance is several blocks north at Bronx Park South and Boston Road. Prior to 1999, the Q44 ran entirely local between Jamaica, Queens and West Farms, Bronx. It was the only bus service along Main Street in Queens. Before the implementation of Select Bus Service in November 2015, the route ran entirely local along East 177th Street. Now it employs an equivalent to limited-stop service on East 177th Street, but with no additional local route operating along the street. The Q20A and B services share the same routing as the Q44 between Jamaica and Whitestone, before diverging west towards their shared terminal in College Point near Flushing Bay. The Q20A branches off at 20th Avenue, running along the northern edge of the former Flushing Airport and serving a large shopping center. This route is shared with the Q76. The Q20B turns west farther north at 14th Avenue, running through a much more residential area. Both the 20th and 14th Avenue routes were part of the original Q20, which only ran between College Point and Downtown Flushing. Both routes provide local service, but the Q20A runs at all times, while the Q20B operates only on weekdays. Two Q44 Nova Bus articulated buses in Flushing, Queens in July 2015, five months before implementation of Select Bus Service. On February 15, 1932, North Shore Bus Company began operating a bus service to replace the Long Island Rail Road's Whitestone Branch. This service was labeled the "Q35". This service was different from the current Q35 service between Brooklyn and Rockaway Park. It ran from the Flushing–Main Street terminal, north along Linden Street (now Linden Place) and 127th Street to 14th Avenue through Flushing and College Point. This is the routing of the current Q25 bus in the area. The original Q35 then ran east along 14th Avenue before following the current Q76 and Q15 routes to Whitestone. On May 2, 1933, North Shore Bus began a shuttle service along Main Street between Main Street/Roosevelt Avenue subway station in Flushing and Horace Harding Boulevard (now the Long Island Expressway) in Queensboro Hill. This was the predecessor to Q44 service. At the time, Main Street had yet to be extended south past Reeves Avenue (the north end of modern Queens College). On September 22, 1935 the North Shore Bus Company acquired, but did not merge with, the Flushing Heights Bus Corporation which operated the Q17 and the Q25 services between Jamaica and Flushing. North Shore only acquired the Q25 on a temporary basis; as compensation, the city assured the company that they would get a new route between Flushing and Jamaica via Main Street. This was planned to go into service after the extension of Main Street, including a bridge over the Grand Central Parkway, was completed. In 1937, several major bus route changes occurred. Queens–Nassau Transit took over the Q25 service and combined it with their Q34 route along Linden Place and 127th Street in College Point (predecessor to the northern portion of the current Q25). The Q35 was discontinued by North Shore, and was replaced by a new Q20 service. The route of the Q20 was the same as the current route of the Q20B (via 14th Avenue), except that it continued north along 122nd Street (now College Point Boulevard) and followed the same looping route as the current Q25 (then Q34) near MacNeil Park at the north end of the borough. In December 1936, North Shore applied for a franchise on route "Q-44" between Flushing and Jamaica via Main Street. On March 22, 1938, Q44 service began between Flushing–Main Street and Archer Avenue at the Jamaica Long Island Rail Road station, when Main Street was extended south to the Grand Central Parkway. The company advertised the route as the shortest "from the entire North Shore" of Queens to Jamaica, running 15 minutes between terminals. Following the opening of the Bronx–Whitestone Bridge in April 1939, North Shore began operating bus service between West Farms Square in the Bronx and the 1939 New York World's Fair in Flushing Meadows–Corona Park on July 1 of that year. On October 28, 1940, this route was combined with the Q44, running from Kew Gardens–Union Turnpike station (along the route that would become the Q74) through Whitestone and along East 177th Street in the Bronx to Tremont Avenue and Boston Road at West Farms Square. An alternate branch ran to Westchester Square, Bronx. By December of that year, the Q44 returned to Jamaica, running to the 165th Street Bus Terminal. A College Point-bound Q20A in Downtown Jamaica. 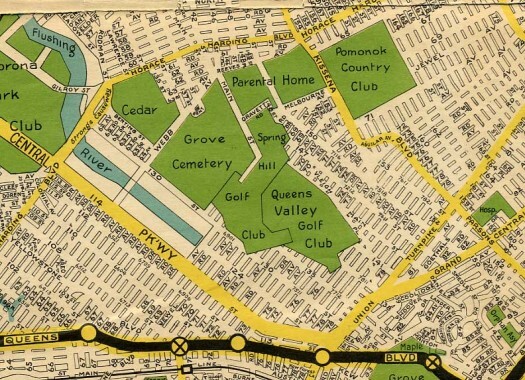 On July 1, 1939, the Q20 became interlined with the Q17, meaning that south of Flushing the bus would continue via the Q17 route to the Jamaica−165th Street terminal. The service was designated "Q17-20" or "Q20-17" and rollsigns would display Q17/20. Beginning on June 8, 1942 due to restrictions on gasoline and tire usage during World War II, the service was truncated to 14th Avenue and 122nd Street in College Point. Service north of 14th Avenue was restored on February 4, 1946. The Q20 was separated from the Q17 during off-peak "base period" hours on January 27, 1947. In March of that year, North Shore Bus would be taken over by the New York City Board of Transportation (later the New York City Transit Authority), making the bus routes city operated. The joint Q17-20 service later became popular among students of St. John's University, and residents from Jamaica Estates and Flushing Heights (now Kew Gardens Hills) shopping in Downtown Flushing. On February 3, 1957, the Transit Authority separated the Q17 and Q20 services at all times, eliminated service north of 14th Avenue and 122nd Street (College Point Boulevard), and renamed the Q20 the Q44FS (Flushing Shuttle). It was one of several routes using the "Q44" designation including the Q44 itself, the Q44A (now the Q46), the Q44B (a shuttle to Malba, Queens which has since been discontinued), and the Q44VP (later the Q74). During the 1964 New York World's Fair, special Q44 service was inaugurated, running to the Rodman Street entrance of Flushing Meadows Park. The routes, designated "Q44 WF" and marked "World's Fair", originated from either West Farms Square or 165th Street and made stops on the Bronx or Queens portions of the route respectively before terminating at the fair. On April 15, 1990, the Q44FS was renumbered to Q20; at this time 20th Avenue service began, when the street was widened and the shopping center was constructed. In September 1995, weekend service was eliminated on the Q20, making it a weekday-only service. On June 27, 1999, the Q44 began limited-stop service in Queens, with the Q20 split into two branches (Q20A and Q20B) to provide local service. Weekend service was also restored on the Q20A. Since the Q44 became limited, the Q20 was extended south along Main Street to make local stops. At this time, the Q44 was shifted from its historical route in the neighborhood of Briarwood between Union Turnpike and Hillside Avenue. It had previously turned east onto the Grand Central Parkway service road and then turned south onto 150th Street towards Jamaica, the same route employed since 1938 when Main Street dead-ended at the Grand Central service road. It was rerouted to continue south via Main Street, and then via Queens Boulevard to Hillside Avenue. On April 1, 2005, Q44 limited-stop service at Main Street and Sanford Avenue was discontinued, with service continuing to be provided by the Q20A and Q20B. In 2004 and 2006, the Main Street corridor was identified as a potential route for Flushing-Jamaica bus rapid transit (BRT) service, as part of the first phase of the MTA and DOT's Select Bus Service (SBS) plan. The corridor was ultimately not included in the first phase of SBS routes. In February 2008, the MTA proposed an additional limited-stop service on the northern portion of the corridor between Flushing and Fordham Plaza, provisionally named the Q94. Eliminating the required transfer to the Bx9 at East 180th Street, it was referred to as a "Super Limited", and would have also replaced the special X32 school service (since discontinued) between Queens and Bedford Park. Though the Q94 was never implemented, the Q44 route was included in the SBS Phase II study in 2009. By 2013, the Q44 was the first route in Queens to have a full fleet of articulated buses; the same buses (the Nova Bus LFS model) used on SBS service. In 2014, the 164th Street corridor (Q65) and the Parsons/Kissena corridor (Q25 and Q34) joined the Main Street corridor as potential SBS routes between Flushing and Jamaica. The Q25 Limited and Q44 Limited were selected for further studies, with the Q44 prioritized due to its high ridership, interborough connection between Queens and the Bronx, and the width of Main Street to facilitate bus lanes. As part of the conversion, several stops in the Bronx were eliminated; those retained constituted 85% of passenger usage in the borough. Several limited stops in the Jamaica business district were also eliminated. On November 29, 2015, the Q44 SBS began service, operating 24 hours a day. The Q20A became a full-time route to replace the discontinued late-night-only Q44 local route. The intersection of Main Street and Northern Boulevard as seen on September 26, 2017, eight days after a crash between a Q20A and a tour bus. The crash damaged the building on the left, which has scaffolding on it as a result of the collision. On September 18, 2017, during the morning rush hour, a private tour bus moving at a high speed collided with the back of a New Flyer Excelsior XD40 Q20A bus turning from Main Street onto Northern Boulevard in Flushing. The bus then plowed into a Kennedy Fried Chicken restaurant at the corner of the intersection. The accident killed 3 people including the tour bus driver, and injured at least 17. The private charter bus company had been repeatedly cited for reckless driving. The charter driver was a former MTA bus driver, until he was fired in April 2015 after a crash in his personal automobile in which he pleaded guilty to driving under the influence and leaving the scene of the crash. ^ a b c d e f g h "Flushing To Jamaica Select Bus Service: January 22, 2015: Public Open House" (PDF). nyc.gov. Metropolitan Transportation Authority, New York City Department of Transportation. January 22, 2015. Retrieved July 6, 2015. ^ a b c d Mooney Jr., Joseph W. (February 1, 1957). "New Bus Schedules Will Force Some Riders to Transfer Twice". Long Island Star-Journal. Fultonhistory.com. p. 6. Retrieved January 11, 2016. ^ a b MTA Regional Bus Operations. "Q20 bus schedule" (PDF). ^ a b c d MTA Regional Bus Operations. "Q44 SBS bus schedule" (PDF). ^ a b c d e "Q44 Select Bus Service: Queens Community Board 12 Transportation Committee" (PDF). New York City Department of Transportation. June 9, 2015. Retrieved October 16, 2015. ^ a b c d Bertrand, Donald (August 12, 1999). "ROUTE OF BUS TROUBLES TRANSIT CHANGES HURT SOME IN BRIARWOOD". Daily News (New York). Retrieved December 16, 2015. ^ a b "Transit & Bus Committee Meeting June 2015" (PDF). Metropolitan Transportation Authority. June 2015. Retrieved December 14, 2016. ^ MTA Regional Bus Operations. "Q20 bus schedule" (PDF). ^ "New Bus Line Seen As Relief to Whitestone". Brooklyn Daily Eagle. January 6, 1932. Retrieved January 3, 2016. ^ "Whitestone Seen Served by Buses When L.I.R. Quits: City Shows No Signs of Activity to Give Rapid Transit to North Shore". Brooklyn Daily Eagle. January 5, 1932. p. 3. Retrieved January 5, 2016 – via Newspapers.com. ^ "City Will Protect Bus Employees By Clauses in All New Franchises; 32 Separate Bids Made for Routes in Queens; Green Line Offers 15 Per Cent for Entire Borough". Long Island Daily Press. Fultonhistory.com. April 6, 1934. p. 9. Retrieved January 12, 2016. ^ a b c "North Shore Bus Routes Changes By Repaving Work: Flushing and Whitestone Projects Necessitate Shifts in Three Lines". Brooklyn Daily Eagle. August 4, 1932. Retrieved January 8, 2016 – via Newspapers.com. ^ "Whitestone Bus Express Service Is Discontinued: North Shore Bus Company Blames Lack of Adequate Patronage" (PDF). Fultonhistory.com. Brooklyn Daily Star. June 28, 1932. p. 14. Retrieved January 8, 2016. ^ Nostrand, George J. (1932). Nostrand's Map New York City: Kew Gardens Hills (Map). ^ "Bus Routes Changed By Zone Plan; Some Riders to be Forced to Transfer; Committee Takes Corona Line From North Shore, Gives It to Tri-Boro". Long Island Daily Press (Long Island Sunday Press) (316). Fultonhistory.com. January 12, 1936. p. 4. Retrieved January 12, 2016. ^ a b c d "Survey Shows Commuters in Zone B Want More Buses Run in Rush Hours: North Shore Passengers Praise Equipment as Improvement". Long Island Daily Press. Fultonhistory.com. April 7, 1937. p. 2. Retrieved January 12, 2016. ^ "Survey Shows Commuters in Zone B Want More Buses Run in Rush Hours: North Shore Passengers Praise Equipment as Improvement". Long Island Daily Press. Fultonhistory.com. April 7, 1937. p. 1. Retrieved January 12, 2016. ^ a b "Franchises Awarded for Thirty-Four Bus Routes". Long Island Daily Press. Fultonhistory.com. September 25, 1936. p. 10. Retrieved January 12, 2016. ^ a b c d e f "For the Convenience of A, B and C Car Owners". Long Island Star-Journal. Fultonhistory.com. December 22, 1942. p. 7. Retrieved January 9, 2016. ^ a b "College Point Backs Move to Curb TA". Long Island Star-Journal. Fultonhistory.com. January 14, 1957. Retrieved January 11, 2016. ^ Eighteenth Annual Report For the Calendar Year 1938. Department of Public Service Metropolitan Division Transit Commission. 1939. pp. 171–172. ^ a b "Main Street Extension Is A 'Hot Potato': With Coming of Fall, Civic Leaders Are Again Demanding Action". Long Island Daily Press. Fultonhistory.com. September 6, 1938. Retrieved January 13, 2016. ^ a b "Buses to Pass Courthouse". Long Island Daily Press. Fultonhistory.com. February 28, 1939. p. 9. Retrieved January 9, 2016. ^ a b North Shore Bus Company (March 21, 1938). "New Bus Line: Traveling Time Cut in HALF". Long Island Daily Press. Fultonhistory.com. p. 3. Retrieved January 9, 2016. ^ North Shore Bus Company (July 11, 1938). "Route Q-44: Flushing and Jamaica". Long Island Daily Press. Fultonhistory.com. p. 10. Retrieved January 9, 2016. ^ "WHITESTONE SPAN OPENED BY MAYOR; New Bronx-Long Island Link Hailed as Symbol of City's Never-Ending Progress". The New York Times. April 30, 1939. Retrieved November 4, 2007. ^ "New Bus Service In Bronx: Line Starts From West Farms Square and Runs to World's Fair" (PDF). The New York Times. July 2, 1939. Retrieved January 9, 2016. ^ a b "Estates Buses Abandon Jamaica Terminal Stop". Long Island Daily Press. Fultonhistory.com. December 16, 1940. p. 1. Retrieved January 8, 2016. ^ "College Point Buses Ready". Long Island Daily Press. Fultonhistory.com. June 30, 1939. p. 26. Retrieved January 13, 2016. ^ a b North Shore Bus Company (February 1, 1946). "To Our Riders". Long Island Star-Journal. Fultonhistory.com. p. 20. Retrieved January 13, 2016. ^ "Bus Schedules Revised to Save Gas and Tires: Transit Commission Order Goes Into Effect June 8 on Queens Routes". Long Island Star-Journal. Fultonhistory.com. May 27, 1942. p. 1. Retrieved January 13, 2016. ^ North Shore Bus Company (January 24, 1947). "Notice of Change in Bus Schedules". Long Island Star-Journal. Fultonhistory.com. p. 11. Retrieved January 9, 2016. ^ a b Mooney Jr., Joseph W. (February 1, 1957). "New Bus Schedules Will Force Some Riders to Transfer Twice". Long Island Star-Journal. Fultonhistory.com. p. 1. Retrieved January 11, 2016. ^ "TA Gets Plea To Reinstate Bus Route". Long Island Star-Journal. Fultonhistory.com. December 19, 1960. p. 5. Retrieved January 11, 2016. ^ "New Queens Bus route Hailed: Welcome Service to Park Area". Brooklyn Daily Eagle. May 4, 1942. Retrieved September 16, 2015 – via Newspapers.com. ^ "TA Schedules Fair Buses". Long Island Star-Journal. Fultonhistory.com. March 23, 1964. p. 3. Retrieved January 13, 2016. ^ "2 New Bus Routes Will Link Brooklyn With World's Fair" (PDF). The New York Times. February 5, 1964. Retrieved December 17, 2015. ^ "Your old bus may bear new number". New York Daily News. April 9, 1990. p. 238. Retrieved February 3, 2019. ^ Hughes, C.J. (October 21, 2011). "Attention, Shore Lovers". The New York Times. Retrieved April 22, 2016. ^ "AROUND THE BLOCK TOUGH BRAKE AS BUS CUTS BEGIN". NY Daily News. Retrieved December 31, 2015. ^ "New Q44 and Q20 services starting Sunday, June 27". New York Daily News. June 28, 1999. p. 634. Retrieved February 3, 2019. ^ "Letters to the Editor: Appeals to Police for Traffic Relief". Long Island Daily Press. Fultonhistory.com. April 28, 1938. p. 16. Retrieved January 13, 2016. ^ "Bus Service Notices Queens". mta.info. 2005. Archived from the original on April 5, 2005. Retrieved July 30, 2018. ^ a b "Introduction to BUS RAPID TRANSIT PHASE II" (PDF). New York City Department of Transportation, Metropolitan Transportation Authority. 2009. ^ a b "MTA 2008 Adopted Budget: February Financial Plan 2008-2011" (PDF). Metropolitan Transportation Authority. February 2008. Retrieved December 26, 2015. ^ "Fordham Plaza: Conceptual Design Study" (PDF). nyc.gov. New York City Department of Transportation, New York City Economic Development Corporation. 2010. Retrieved September 24, 2015. ^ Block, Dorian (February 19, 2008). "Upgrades for crowded subway & buses". Daily News (New York). Retrieved December 26, 2015. ^ Bertrand, Donald (February 25, 2008). "Summer hike in subway, bus services". Daily News (New York). Retrieved December 26, 2015. ^ "Effective November 29: Q44 Select Bus Service". Metropolitan Transportation Authority. 2015. Archived from the original on November 12, 2015. Retrieved November 15, 2015. ^ a b Gardiner, Aidan; Kapp, Trevor; Honan, Katie (September 18, 2017). "3 Dead and 16 Hurt as 2 Buses Crash in Flushing, Officials Say". DNAinfo New York. Archived from the original on September 18, 2017. Retrieved September 18, 2017. ^ Bromwich, Jonah Engel; Harris, Elizabeth A. (September 18, 2017). "3 Killed and More Than a Dozen Injured in Bus Crash in Queens". The New York Times. ISSN 0362-4331. Retrieved September 18, 2017. ^ a b Ray, Esha; Crane-Newman, Molly; Dimon, Laura; Brown, Stephen Rex (September 18, 2017). "Tour bus driver races through Queens intersection and plows into MTA bus, killing three, injuring 17 others". New York Daily News. Retrieved September 19, 2017. ^ Rivoli, Dan; Parascandola, Rocco; Rayman, Graham (September 18, 2017). "Tour bus driver killed in Queens crash had license suspended after DUI crash that hurt three in 2015". New York Daily News. Wikimedia Commons has media related to Q20 (New York City bus) and Q44 (New York City bus). This page was last edited on 13 March 2019, at 22:21 (UTC).